Exam period is taking its toll on me. I really, really miss home. I've been getting into fights left, right, and center. I feel like curling up into a little ball, watching a movie, and making the rest of the world disappear. Anyway, in the spirit of exam-induced depression, I thought I'd do the Kardashian thing and do black nails. Whilst looking through the nail polish thread in search of the perfect nail colour to match Olivia Palermo's, I also came across this beautiful black colour that I knew I just had to have. 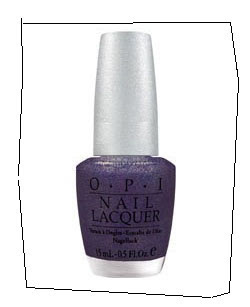 I checked the name of the nail polish - OPI Designer Series in Mystery. Didn't sound familiar - but I knew I had a 'designer series' bottle that I'd just bought over the holidays. So I didn't keep my hopes up, but I checked the bottle anyway - OPI DS in Mystery. Yay! It looks just the way it does in the nail swatch above - the picture of the bottle must have been lightened to show the colour. 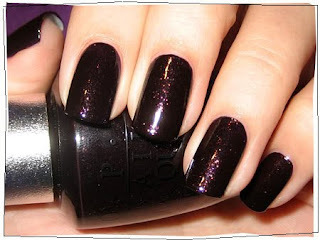 It's a black colour, but the glitter inside it gives it a deep purple tinge that sparkles as you move. Gorgeous. And just the thing to pick me up a little, after all the exam stress. And you can get your hands on a bottle too - whether you're unhappy or just wanting to feel glam.